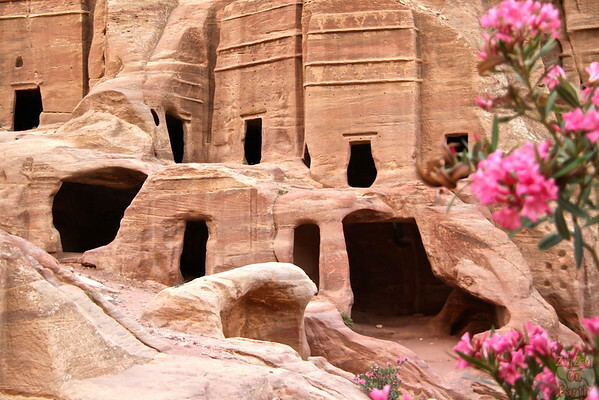 From the magnificent Treasury, the path continues along a narrow gorge before opening up to the valley. What is the lower road? I called the lower road, the whole path from the Treasury to the Museum which is at the foot of those cliffs. 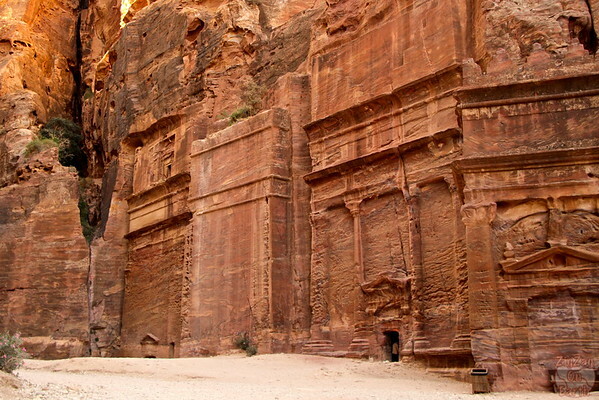 Many monuments are located on both sides including the theater, the street of facades, the colonnaded street. You can find well maintained toilets along the way but not much shade apart from the cafes. 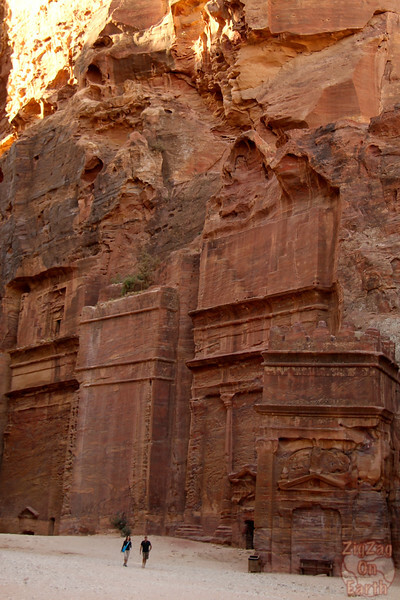 Along the lower road of Petra you first admire the street of facades with many tombs lined up along the cliff. The second photo gives you an idea of the scale. 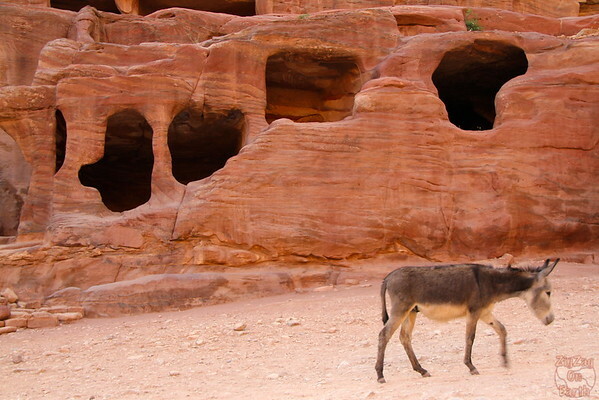 They are actually everywhere in Petra (as I realised later with my binoculars from the high place of sacrifice) but this is the best place to see them unclose without too much walking. 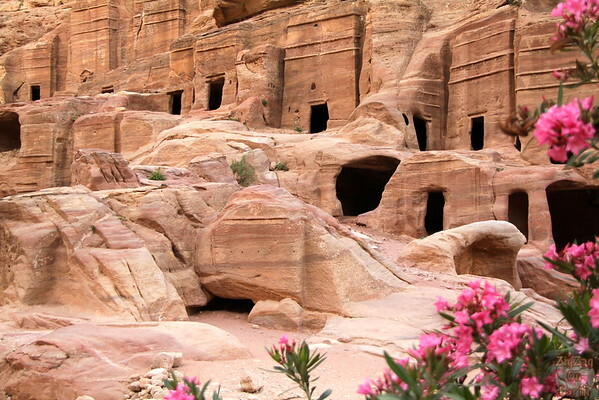 Some caves where also cut in the mountains for the family to stay when visiting the tombs. After the street of facades there is a theater. It is crazy, but apparently I did not take any photo of it which is so not like me. 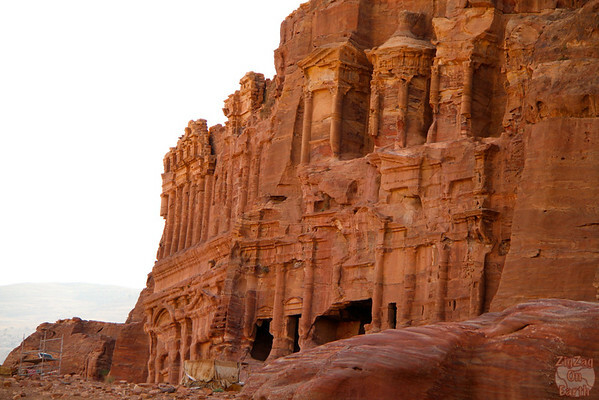 So please google it to see what it looks like (Nabatea has some details on it). 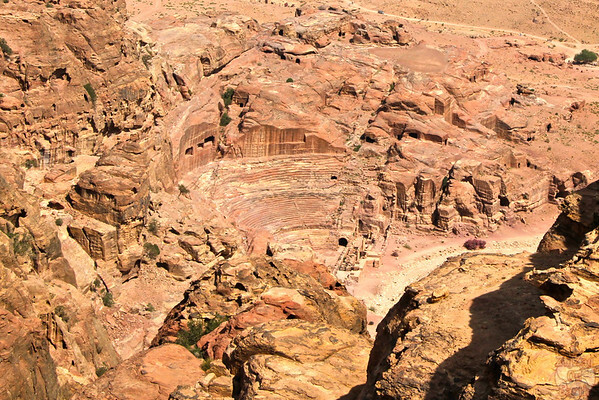 Maybe it is because it was the 4th theater I saw in only a few days (one in Amman and two in Jerash). I just have a photo from above while I was doing a detour from the Madras Trail. At the end of it I found one bench which had a little bit of shade at 10am and rested a little bit. It was really enjoyable, the sun can be very strong. A local walked buy and saluted me and I answered in Arabic. As I said good morning and not the typical welcome phrase that most tourist know he thought I was spaeaking Arabic and started telling me something…hummm…try again. So he switched of to English and within a few minutes he suggested he could find me a husband! Fun discussion. And considering I was doing this tour alone, I enjoyed this time. Don’t you find those pink facades fascinating? 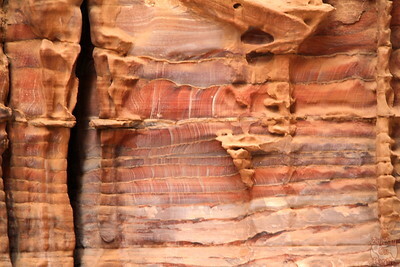 From the Treasury, the passage broadens into what is commonly referred to as the Outer Siq. 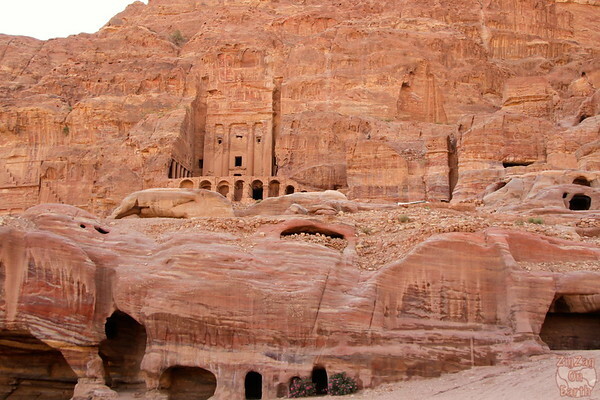 Riddling the walls of the Outer Siq are over 40 tombs and houses built by the Nabataeans in a ‘crow step’ style reminiscent of Assyrian architecture. Amazing place.